Devices of column type, in comparison with the classical, have more opportunities. Due to the presence of a hollow cylinder (column) between the distillation cube and the helmet, it is possible to saturate the finished product with pleasant fruit notes, berry fragrances, and also other shades of smell and taste. 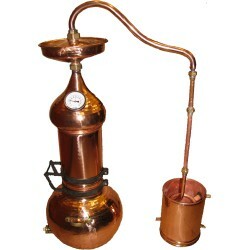 In addition, a copper moonshower with a column is ideal for floral waters, hydrolytes and essential oils. The column in the construction of copper alumbic is a reservoir for various substances of organic origin. During the preparation of the distillate, the steam from the distillation cube passes through the organic matter, thereby capturing the essential oils that are released. As a result, the obtained product acquires aromatic notes of the product placed in the column. 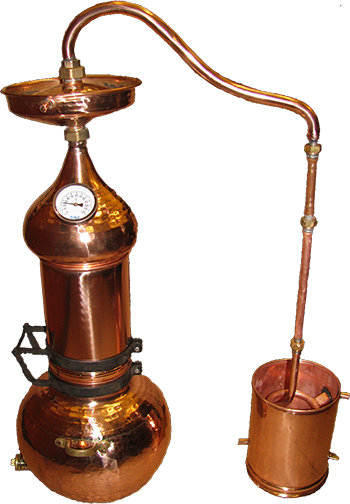 In addition, the moonshine column apparatus can easily be converted into a classical one, by removing the cylinder with a sieve, which makes it possible to buy a distillation cube of a similar design, and to use additional functionality only if necessary. Alambic with the Column + lens There are 7 products. When using the distillation of the lens extending in the kit, you can get alcoholic drinks a fortress to 90 °.